ABOVE: A screenshot from the video. NUTLEY, NJ — Nutley Public Schools were closed for students and staff on Friday, February 16th, due to what has been reported as a “security threat” sparked by an Instagram video. Citizens’ Media TV has obtained the video through a Nutley High School student, “Lars.” Due to his age, Lars asked that we not use his real name. 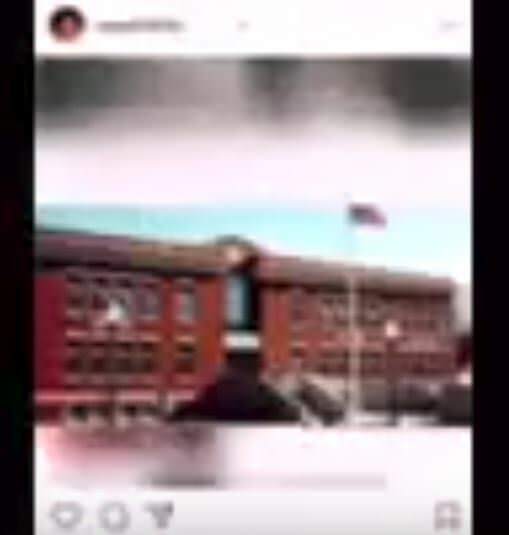 The thirty-eight second video, shown below, depicts a slideshow including photos of a public school and two young men holding firearms, among other unrelated images. The slideshow is set to Pumped Up Kicks by Foster the People, a controversial song about the topic of school shootings, criticized for its sympathetic depiction of the perpetrator of a mass shooting. Nutley Police has stated via Facebook that they are investigating the video and have interviewed a student who was involved with the video being posted. At this time, police do not believe that the video constitutes a credible threat against Nutley Public School District, which consists of a high school, a middle school, and five elementary schools: Lincoln, Radcliffe, Spring Garden, Washington and Yantacaw. Lars, our source, stated that he is not aware who posted the video and has not heard of anyone being questioned. Lars also confirmed that the school depicted in the video does not match the appearance of Nutley High School or the local middle school, John H. Walker. This Google result seems to indicate that the photo is a generic image pulled from a Google search. The panic in Nutley arrives on the tail end of a tragic week marred by a school shooting in Parkland, Florida that claimed seventeen lives. 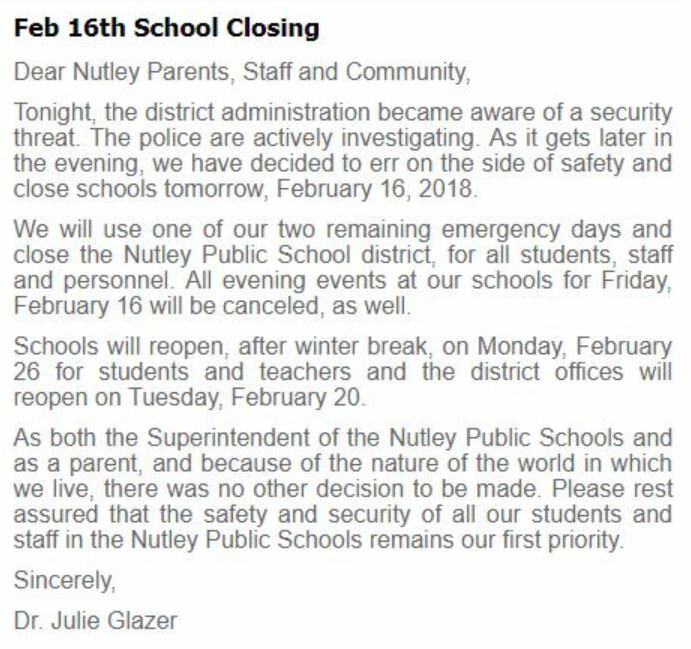 ABOVE: The school closing notice posted on www.nutleyschools.org, as accessed 2/16/18 at 4 PM. Students will return to school on Monday, February 26th, after the Presidents’ Day break. The break from February 19th to February 23rd was a vacation that was scheduled well in advance, unrelated to the closure on Friday, Lars told us. This incident, though possibly a false alarm, highlights a unique tension that has been gripping our country. On the same day as the Nutley shut-down, police in Jackson, NJ received what they judged to be uncredible reports of a “hit list” circulating on social media. Jackson ultimately went forward with its scheduled school day. This event is an epitome of teenage culture: going to extreme lengths for attention and brief fame, or just simple Instagram likes. Even if [attention-seeking behavior] gets the police involved and a whole town on edge, teens will still do it for the notoriety. At a time when we as a society are struggling to determine and head off the causes of mass shootings, social media-related false alarms muddy the water, making it difficult to determine which offenders are emotionally troubled, which are attention-seeking, and which may have truly gone on to carry out their plans, given enough time. The line between a legitimate threat and an attention-seeking hoax is being blurred as we increasingly catch offenders before they do the unthinkable. We are increasingly losing the ability to discern which threats are credible, creating a high alert that will only increase the amount of police brutality, misidentification, and mutual fear between law enforcement and the public. It is unclear if or why the students who posted the “threatening” video would have carried out any act of violence. However, with the plot thwarted, we may never know the truth, condemned to hear the testimony of children who may make confessions despite not understanding why they did what they did, interpreted through the lens of adult lawyers who cannot identify with the mindset of a teen, and amplified through a media that has years of experience presenting streamlined same-day coverage of shootings. As the problem continues to go unsolved and the pace of shootings increases, news coverage will inevitably become more similar than different from shooting to shooting. It is unclear if we will ever truly be able to analyze school shootings outside the lens of the previous major shooting. We may be doomed to forever compare the next tragedy to the last, learning nothing.